Miyako Japanese Steak and Seafood at Great Lakes Crossing in Auburn Hills, MI – review, pics, hours, and menu info. Miyako is a hibachi style restaurant that is family-friendly, and serves Japanese entrees fired up at tabletop grills, plus sushi and cocktails. Miyako Japanese Restaurant is located near Entrance 6 in Great Lakes Crossing in Auburn Hills MI. 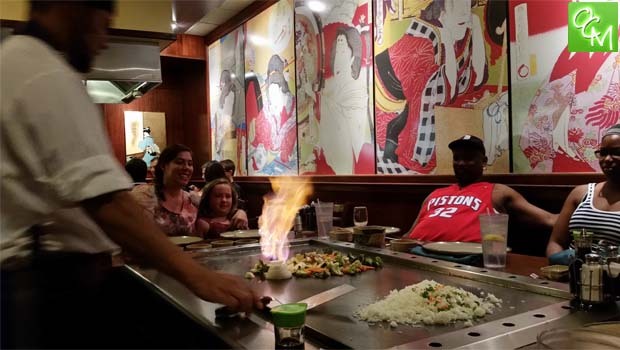 The chefs at Miyako Japanese Restaurant are entertaining and great at keeping the kids engaged with all their “tricks”… tossing eggs with a spatula, spinning knives, onion ring volcanoes, and more. They may even throw in a silly joke like the squirting ketchup bottle that uses red string. Miyako Japanese Restaurant offers typical Japanese fare cooked deliciously on the grill. Meats, seafood, vegetables, noodles, fried rice… Everything was cooked perfectly. Soup and salad are served before the meals. The sauces that served worth the meals are a great accompaniment for the rice, meats, seafood and dipping the grilled vegetables. We also ordered some Sushi rolls. The rolls were a decent size and very fresh. I’ve paid the same prices at other places and got much smaller rolls. My son loved his so much he ordered a second one! And, right after he said he was so full, I caught him eating the grilled shrimp, rice, and noodles. Miyako Japanese Restaurant also has tables for regular dining and ordering off the menu. Menu items include Teriyaki and Hibachi dishes using meats (chicken, steak, filet mignon) and seafood (shrimp, scallops, calamari, white tuna, and lobster). See our REVIEWS/RESTAURANTS tab for more Oakland County and Metro Detroit MI restaurant reviews, pics and more.